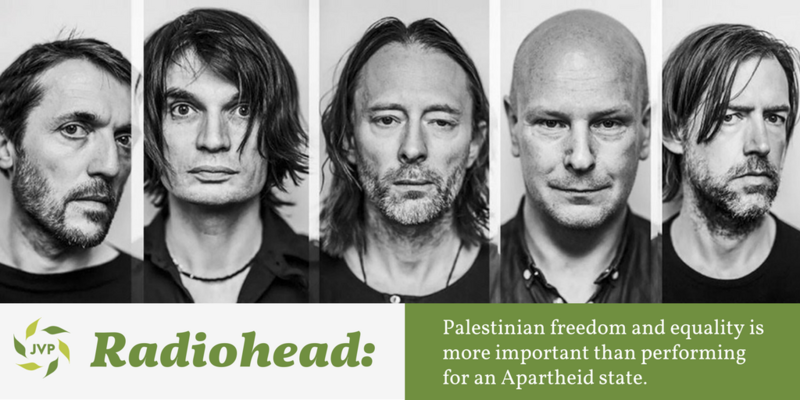 Palestinians urge Radiohead to cancel their 19 July concert in Israel and respect the cultural boycott picket line. We, as Palestinian artists and cultural institutions, appeal to you to cancel your upcoming concert in Tel Aviv in July, as such a performance, irrespective of intentions, will help Israel’s regime of occupation and apartheid cover up its massive violations of Palestinian human rights. Just as South Africans called for boycotts -- including cultural -- during the apartheid era, Palestinians have since 2004 urged renowned artists like yourself to not entertain yet another apartheid in our time. The Palestinian Performing Arts Network released a call in 2015 urging artists and cultural institutions around the world to help end the occupation.They note that “Despite all the hardships, Palestinian arts and cultural institutions continue to work in the West Bank, Gaza Strip and East Jerusalem, using the arts to mobilize and educate.” Your performance in Tel Aviv will only help in the perpetuation of Israeli crimes against the Palestinian population generally and Palestinian artists specifically. Many notable artists and writers have endorsed our cultural boycott call including Danny Glover, Myriam Margolyes, Roger Waters, Gillian Slovo, Mike Leigh, the late John Berger, Brian Eno, and Alice Walker. More than 1,200 cultural figures in the UK, in fact, have signed a pledge “to accept neither professional invitations to Israel, nor funding from any institutions linked to its government until it complies with international law and universal principles of human rights.” Many bands and artists have also cancelled performances in Tel Aviv, such as Lauryn Hill and Massive Attack. As it says in the video of your song All I Need, “some things cost more than you realize.” Your performance in Tel Aviv will cost us dearly as it will help to prolong Israel’s decades-old occupation, colonization, and entrenched system of apartheid that denies us our equal rights by law, not just policy. Just after the UN Security Council reiterated the illegality of Israeli settlements under resolution 2334, on 23 December 2016, Israel passed a law that would retroactively legalize the theft of private Palestinian land for settlements. Israel cannot maintain this level of criminal impunity and colonial arrogance without the facade of “democracy” that international performers help to polish. We sincerely hope that you shall reconsider your performance and join the growing ranks of artists who stand on the right side of history, with the oppressed in their struggle to end oppression.